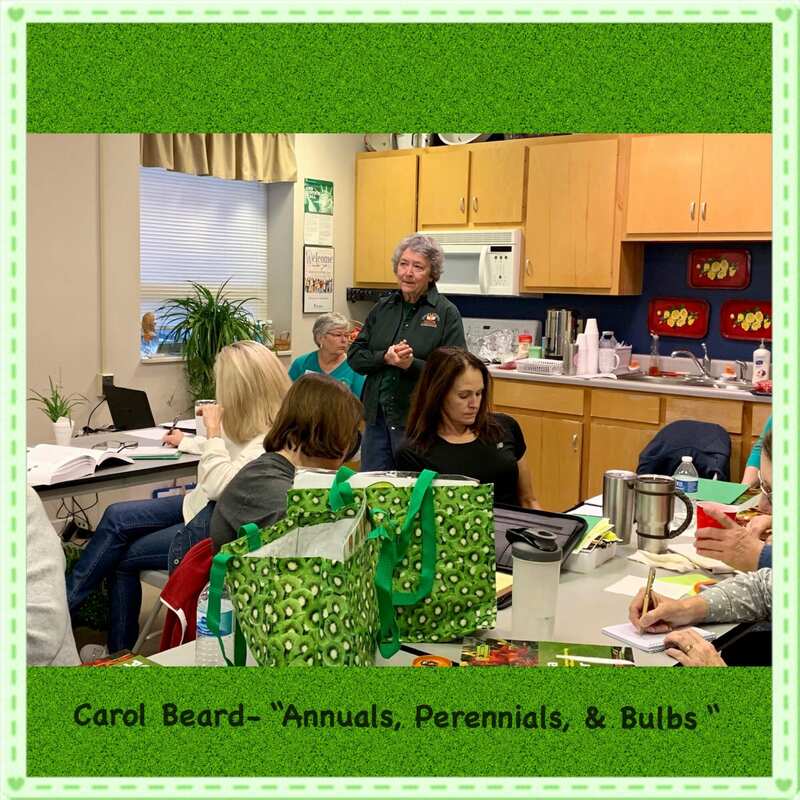 Debbie Boutelier, an Herbalist as well as a certified Master Gardener, spoke on growing and using herbs at the CCMGA April meeting. Most herbs required full sun and well drained soil so raised beds or pots are great ways to grow them. Of all the herbs she discussed most contain medicinal properties such as antibiotic, anti-fungal, and anti-septic. Herbs are often used to season our food but can also be used to make tisanes (teas), as tinctures, in cleaning products and more. 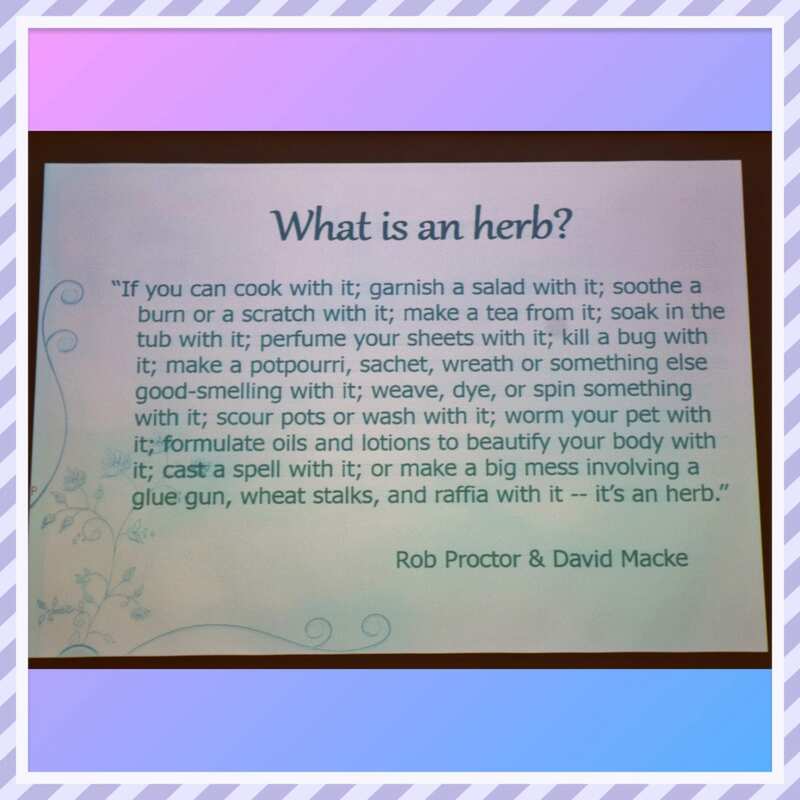 Debbie suggests that we do our own research before using any herbs medicinally or to consult an herbalist. 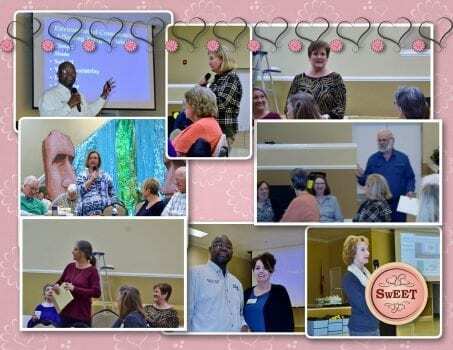 Our March meeting was held at the Little House this month, and there was a full house! Our program was presented by Dr. Edgar Vinson, ACES Assistant Research Professor & Extension Specialist in Horticulture. Dr. Vinson plans on starting a new fig plot at CREC soon. He says that figs are becoming a production crop like peaches, blueberries, and strawberries because of their nutritional value. The other highlight of the meeting was our Awards Program delightfully emceed by our own Skip Coulter. Top Hours were Harriett Jackson (580), Alice Broome (440), and Audrey Giles (407.50). Helpline Awards were Pat Farmer (Chairman, 5 days), Larry Jones (7 days) who received gold pins; Lanell Baker (4 days), and John Wallace (3 days) who received silver pins. Susan Cleckler won Top CEU hours with 43.50. 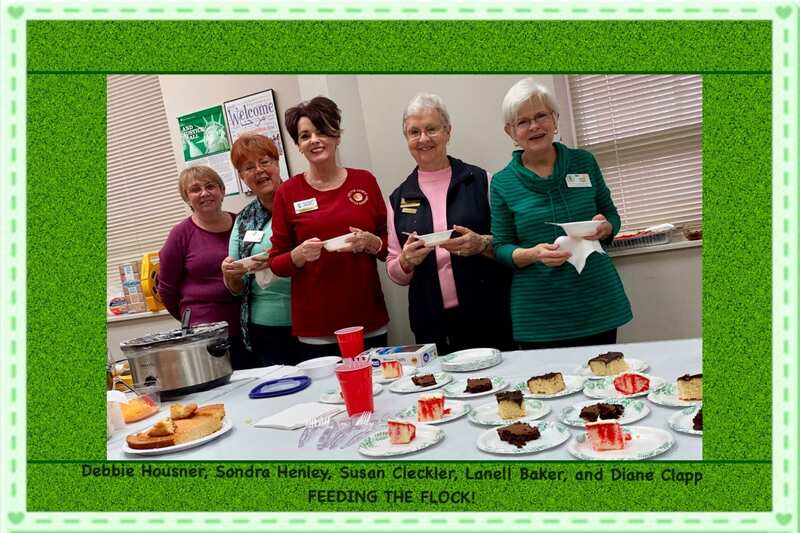 Service Project of the Year nominees were Gardens of Clanton Assisted Living ( Trisha Williams & Audrey Giles) and Chilton/Clanton Library Adult Summer Program (Trisha Williams & Audrey Giles, Natives in the Garden; Sondra Henley, Composting 101; Larry Jones, Vegetable Gardening; and Lanell Baker, Starting Plants from Seeds. 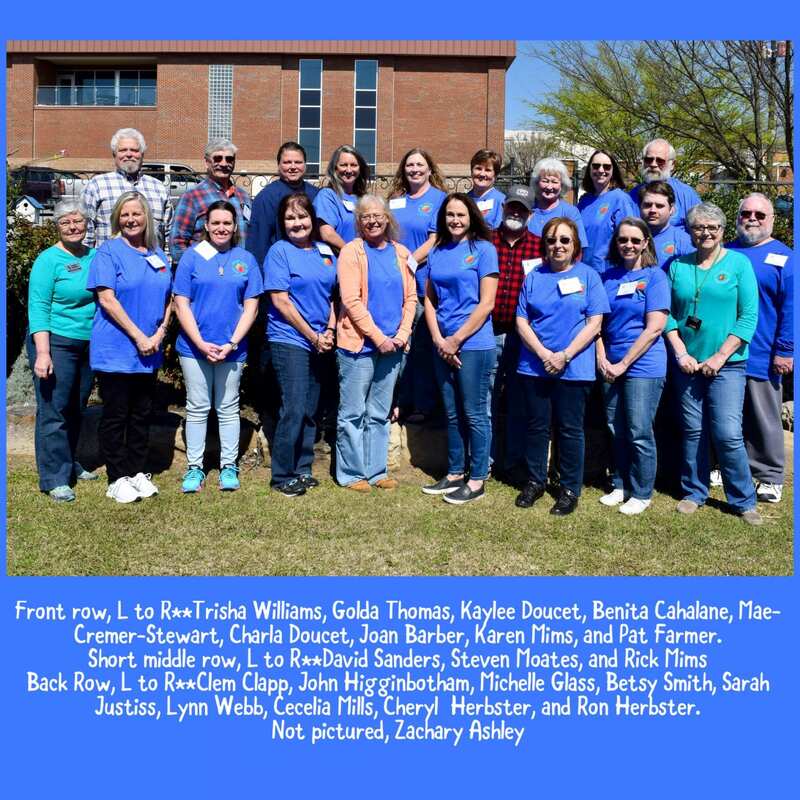 The Service Project of the Year was Gardens of Clanton Assisted Living. The Master Gardener of the Year nominees were Alan Reed and Lee & Wally Walters. The MG of the Year was veteran MG Alan Reed. Badges and Stars were also given out at the meeting. There were 28 members , 7 Interns, and 3 visitors present at the Awards Program meeting. 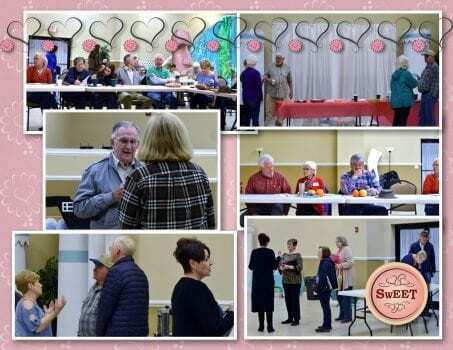 Click on the link below to see a slideshow of photos from the March meeting. The weather was gorgeous this past Wednesday so we took advantage of it and got outside for our group class photo. 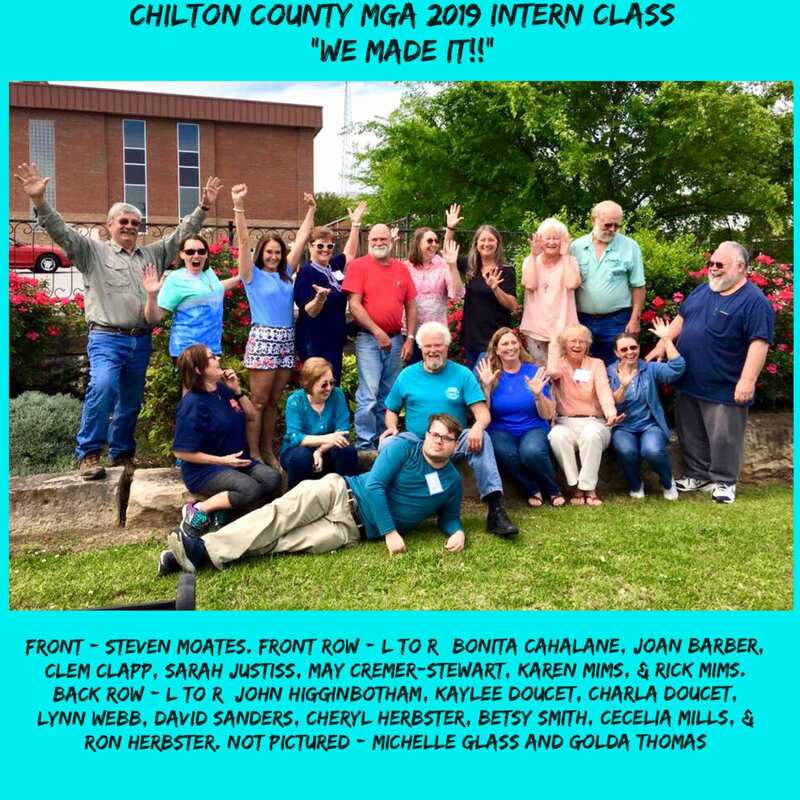 Thanks 2019 Intern Class for being such a great class this year! 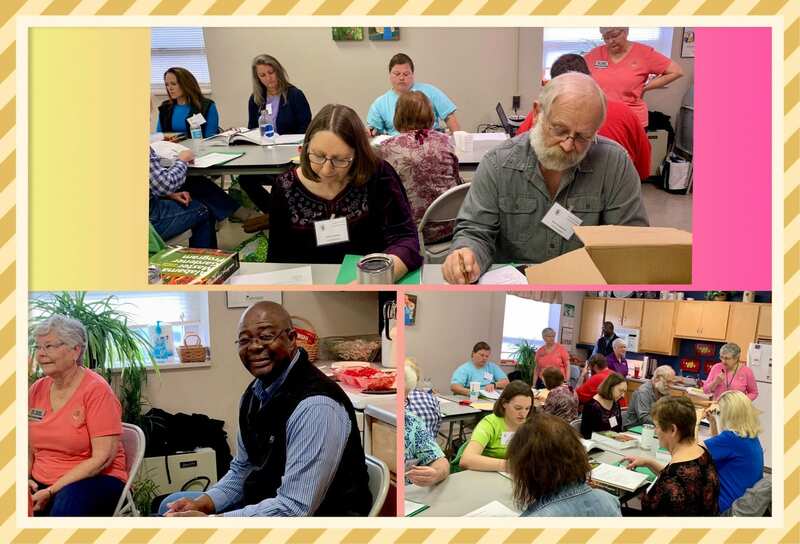 At the February 28, 2019 meeting of the AMGA Conference Volunteers, anticipation was building as Tracey Britnell, a Conference tour speaker and employee of Petals from the Past, drew the winner’s name from the early registrants. 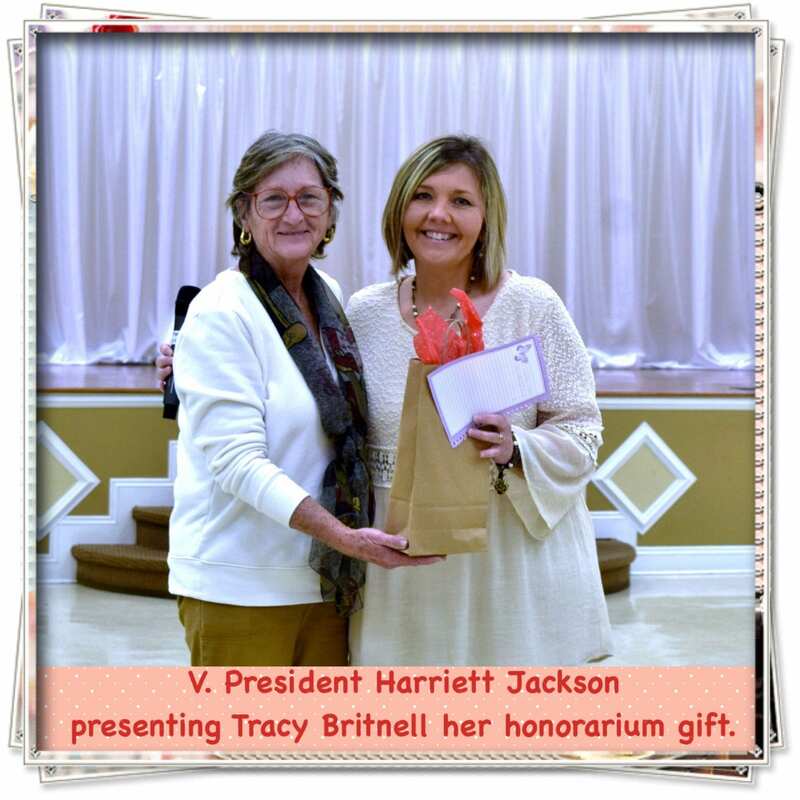 Registration Chairman Alice Broome held the bag for Tracey. 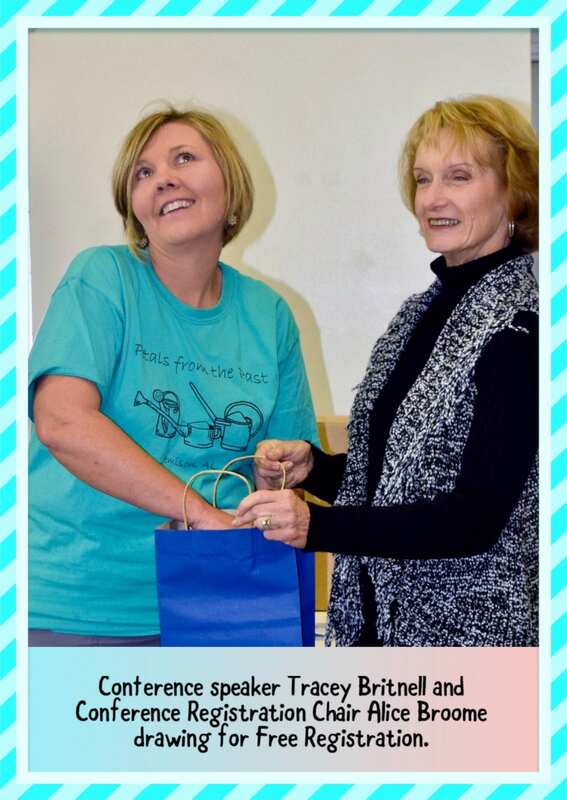 AND THE WINNER OF EARLY REGISTRATION IS…….Laura Fields from Tuscaloosa Master Gardener Association!! Congratulations, Laura, your registration to the 2019 AMGA Spring Conference is paid for! 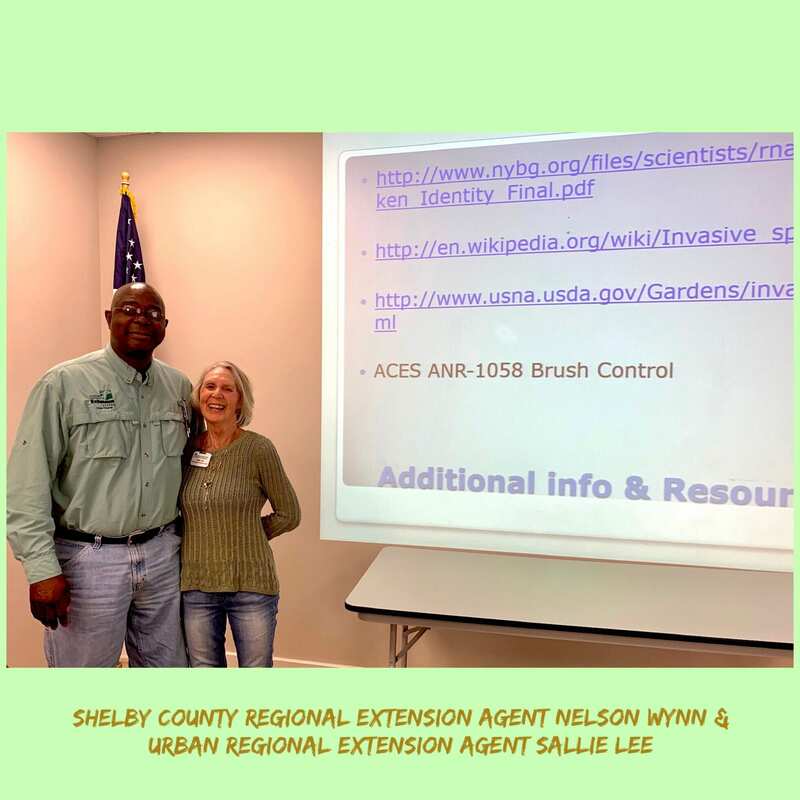 Nelson Wynn, ACES Regional Agent, presented the program for our monthly meeting February 12 on “Lawn Care”. We had a great turnout, despite the rainy weather! 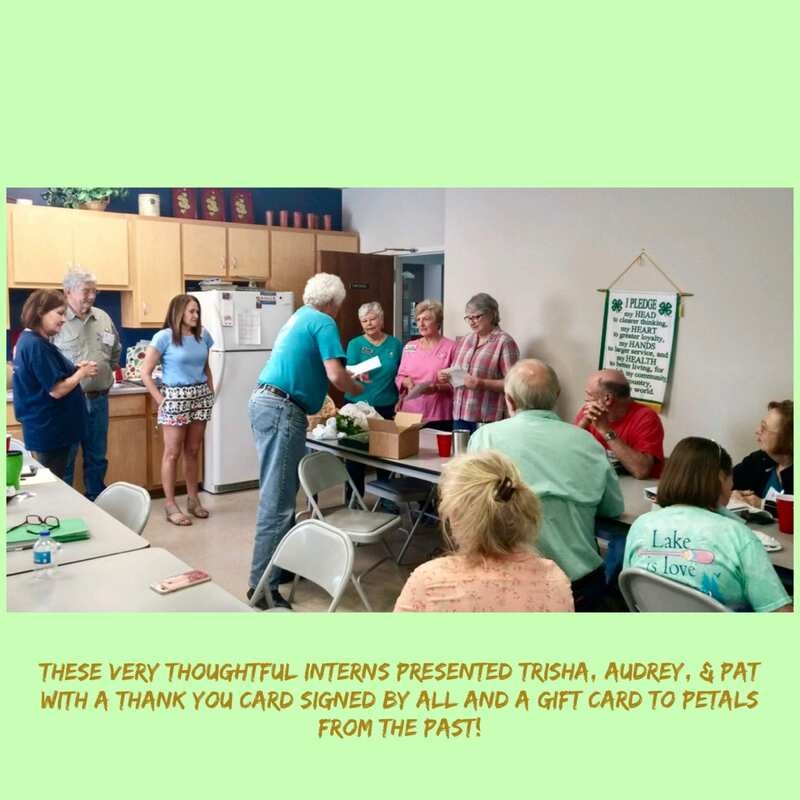 We had 10 interns present from our 2019 Master Gardener class! Our January 30 class was cancelled due to a strong possibility of snow. That class will be held on April 17. 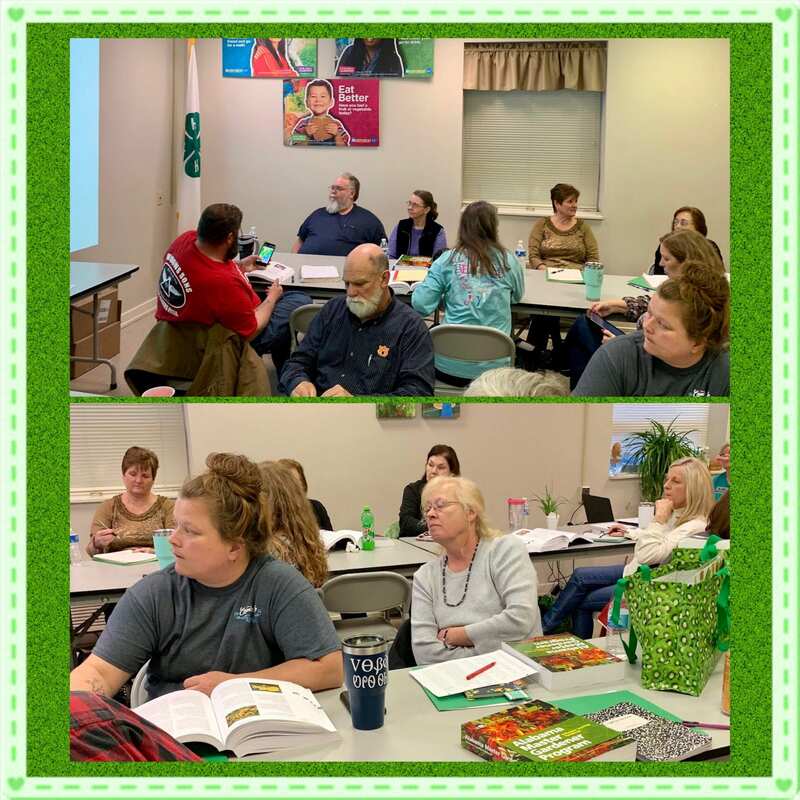 February 6 class was Plant Care and Management taught by Bethany O’Rear. Soil samples were brought back to be turned in to Auburn. Class shirts were also ordered. 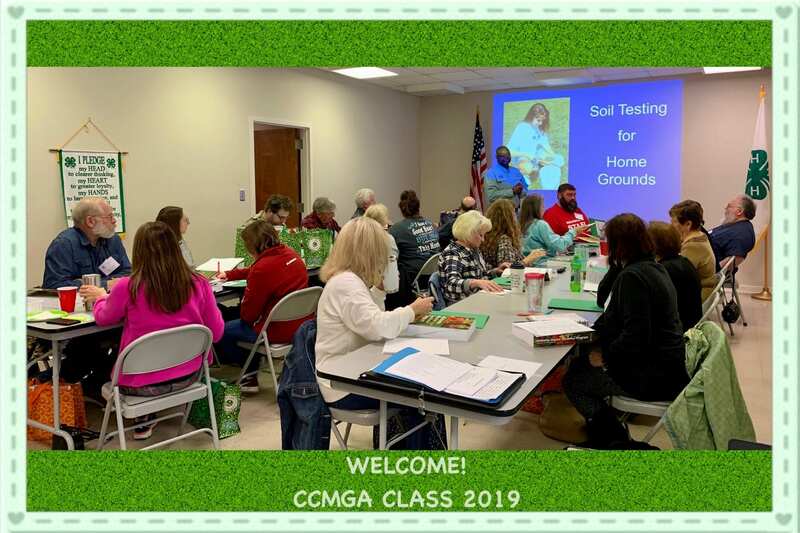 The Master Gardener classes got under way on January 23 with 20 registered and in attendance. 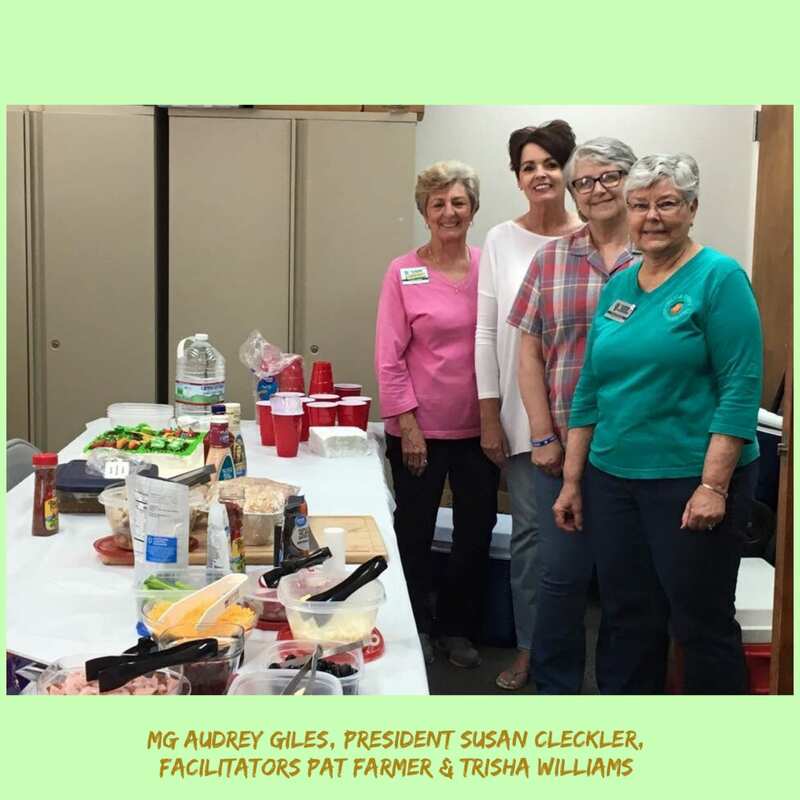 The Association provides the first meal for the class as a way to get acquainted. Several kinds of soup were a big hit, as were cakes for dessert. Looks like this is going to be a great class! 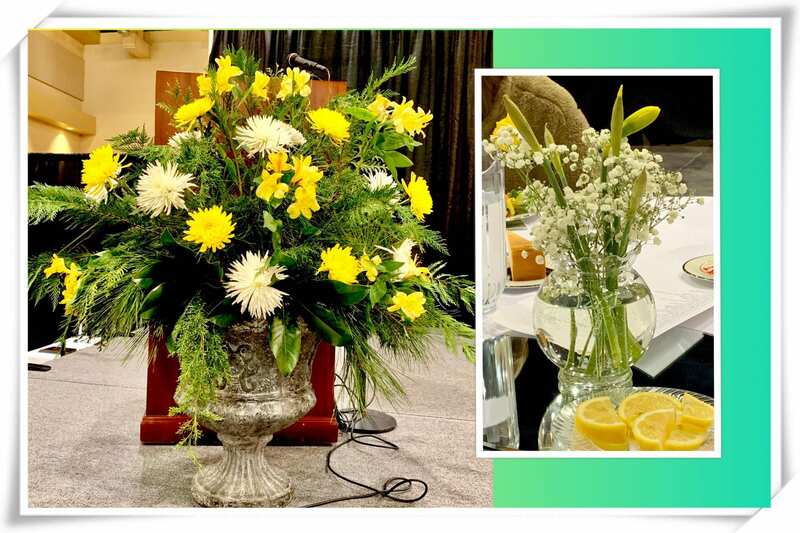 Chilton County Master Gardener Audrey Giles was approached by Chilton Chamber director Francine Wasden a couple weeks ago and asked if any of the Master Gardeners would be interested in making a flower arrangement for the stage the night of the annual banquet. The board got together and decided to ask our very talented Treasia Bennett if she would do this. She graciously accepted and created this beautiful arrangement for that night. 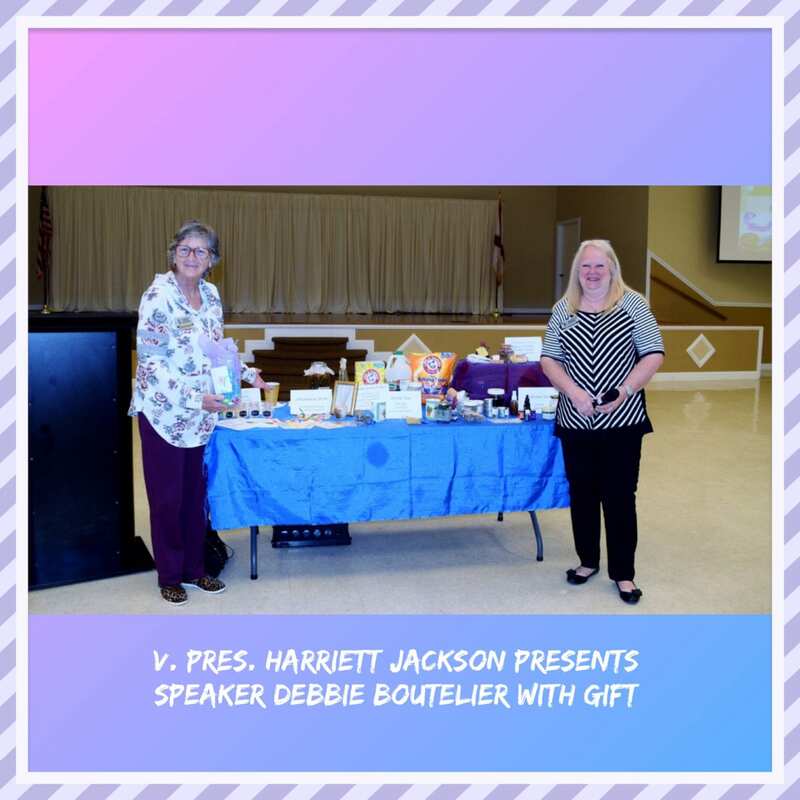 Aren’t we glad she’s our decorating Chairperson for the 2019 AMGA Spring Conference we’re hosting here in May? 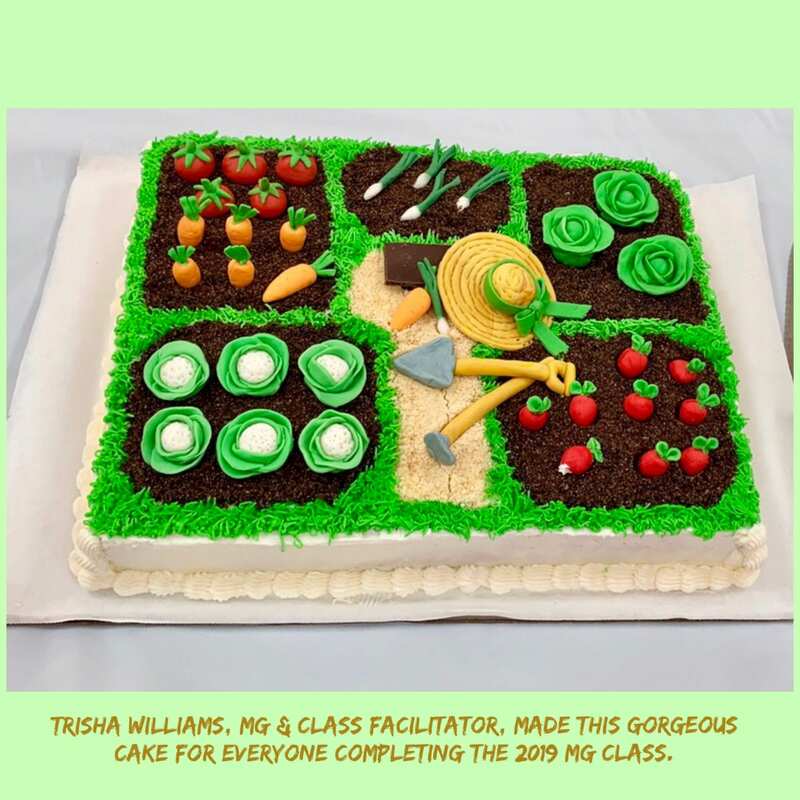 Great job, Treasia! 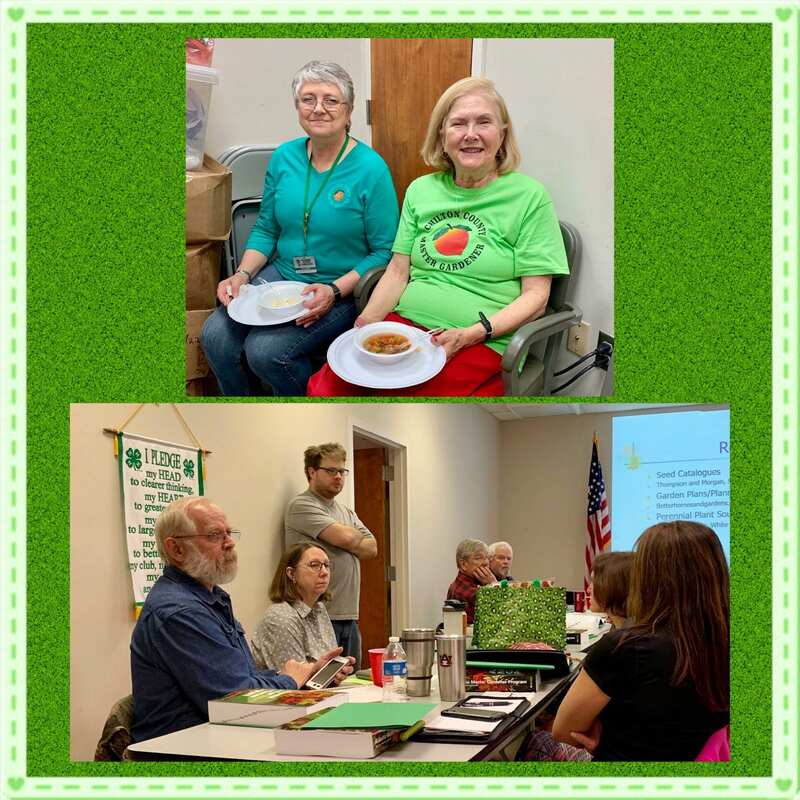 Chilton County Master Gardener 2019 President, Susan Cleckler, welcomed us to our first meeting of the year. 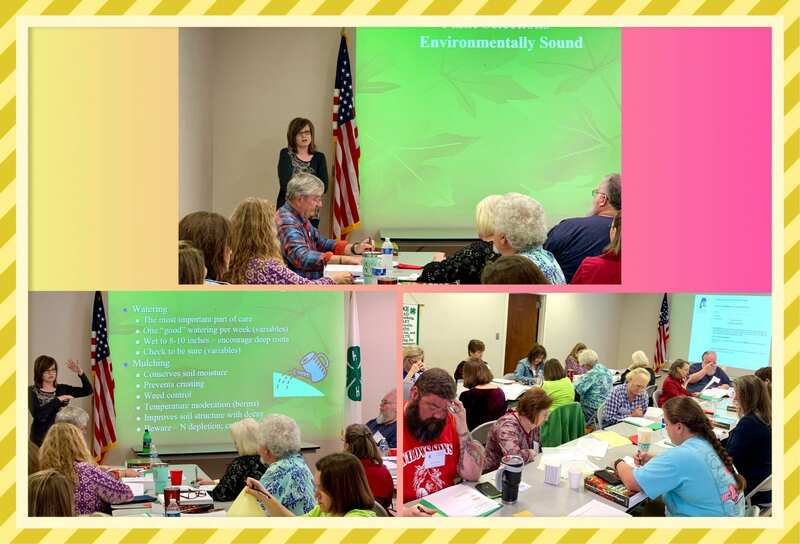 We enjoyed a program on Permaculture presented by Tracy Britnell. Tracy and her husband are experimenting with permaculture on their farm and want the farm to be an educational site. It took about a year to get the soil ready to start planting. Since then, they have been using permculture methods. Inter-planting various plants to draw beneficial insects and repel others is one permaculture method. Another is using nitrogen fixing plants to help with fertilization. One of the goals of permaculture is to garden without using chemicals. Tracy is currently building a blog about her farm and methods and will share her research on the blog.